Late Eastern Zhou Dynasty, Chu State, circa 3rd Century B.C. carved from a single block of wood, the elegantly stylized tall slender figure shown standing in a respectful pose, bent at the waist very slightly, the large head with flattened face and angular features including wedge-shaped ears and a triangular nose, the wide eyes painted in black under ridged eyebrows and the pursed lips painted in red, wearing long robes with deep sleeves cut with mortice-slots at the front, now lacking hands, the robes rising in a high arc below the knees, revealing the hem of the undergarment hanging down in a point in front of baggy pants, and with one flat square-toed shoe remaining, the surface of the garments showing extensive painted details in vermillion and black lacquer thinly applied, including zig-zag ‘lightning’ patterns on the collar and around the hem. 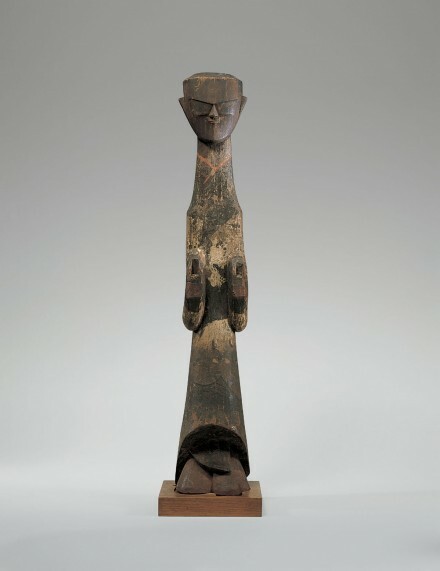 This figure is one of a group discovered in Changsha, Hunan 1936 at sites associated with the ancient state of Chu, first shown in America at the Yale University Gallery of Fine Arts, described in a catalogue entitled An Exhibition of Chinese Antiquities from Ch’ang-sha: Lent by John Hadley Cox, New Haven, 1939. A very similar lacquer-painted wood figure in the Princeton University Art Museum is illustrated by Liu, Nylan and Barbieri-Low in Recarving China’s Past, New Haven, 2005, pp. 238-241, with a detailed discussion by Virginia Bower giving references to excavation reports of closely related wooden tomb figures found in the Changsha area and citing other wooden tomb figures including a few found in the north, attributed to the late Spring and Autumn period. Other wood figures of this type were exhibited at the Museum of Fine Arts, Boston and illustrated in the catalogue by Fontein and Wu, Unearthing China’s Past, Boston, 1973, pp. 72-74, nos. 23-26, and a lacquered wood figure of this type is illustrated by Hearn and Fong in The Secularization of Art: The State of Ch’u, The Metropolitan Museum of Art Bulletin, No. 2, 1973/1974, fig. 37, where the authors note that these figures were made as substitutes for sacrificial human victims and were intended to serve the deceased in the afterworld. The same figure from The Metropolitan Museum of Art is illustrated again by Jenkins in the catalogue Masterworks in Wood: China and Japan, Portland, 1976, p. 22, no. 2.